This image released by Warner Bros. Entertainment shows Gal Gadot in a scene from "Wonder Woman," in theaters on June 2. 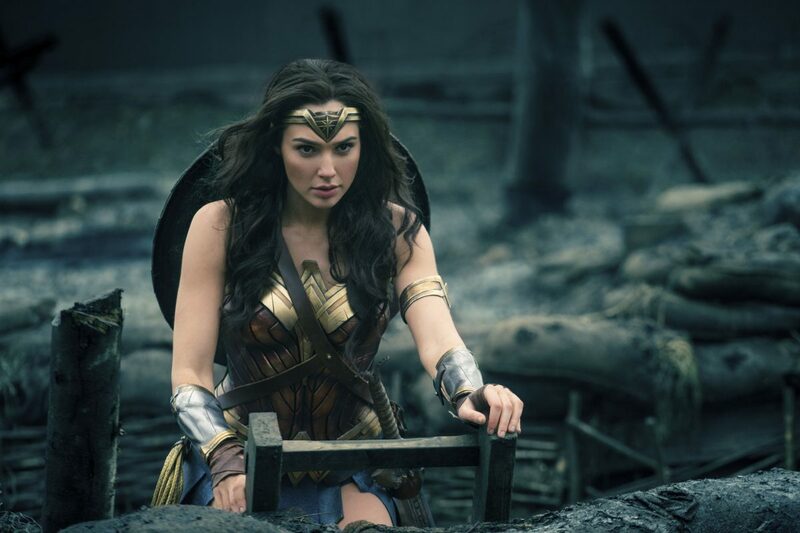 The film grossed $103.1 million in North America over its debut weekend, a figure that easily surpassed industry expectations, set a new record for a film directed by a woman and bested all previous stand-alone female superhero movies put together. From the opening scene of Patty Jenkins’ film adaptation of “Wonder Woman,” we see the titular heroine in a modern, elegant dress, gazing upon another side of herself seven decades prior, photographed in battle gear, surrounded by World War I soldiers amidst a town gutted and blackened by war. All the inhabitants of the photo, herself included, possess the gaze of the soldier: looking through and beyond the camera, too full of the visions of combat and death that surround them. The soldier will always exist within and without the society he or she returns to, desperately searching for the comfort and security of home and finding it forever pigmented by the horrors of war. For Diana, Princess of Themyscira, daughter of Hippolyta, her life began as this duality and she will forever be within and without the world in which she lives, the pigments between becoming more evident with maturity and experience. If superheroes are supposed to be heightened versions of ourselves at our brightest and darkest points, then it is no wonder women are appreciating this character on screen, bringing their daughters to additional screenings, recognizing such duality in their own lives: that of object and agent. As Diana (Gal Gadot) looks back on her childhood, we see her home on Paradise Island with the Amazons, a band of female warriors who had been created by the Olympian gods to protect mankind, only to later be enslaved by them. It was Queen Hippolyta (Connie Nielsen), Diana’s mother, who led the Amazons to revolt and win their freedom. Diana begins as an object, moulded from clay by her mother, and given life by Zeus — thus, her earthbound and divine origins coexist. Though sheltered on the beautiful island paradise, far away from the world of man, the Amazons do not rest on their laurels and eat grapes by a waterfall; rather, they remain vigilant and adept at combat, proactively preparing should they be confronted by man again. Hippolyta and her sister, Antiope (Robin Wright), debate this inevitability and the depth of Diana’s immersion in their exercises. “You neglect your duty if she cannot fight,” Antiope tells her sister, and secretly trains her niece through adolescence to realize and harness her own strength. Antiope’s words are the most pertinent in the film, and probably the most relatable to the female audience who themselves deal with a world whose rules they were not included in establishing, whose expectations of them are almost impossible to balance, and whose perceptions they fight daily to shatter. Once her physical and divine powers begin to emerge, Diana immediately wants to use them as an agent of change. Queen Hippolyte is overprotective and fearful, with good reason from her past experience, but her daughter is too much like her to remain passive for long. The first significant time we (and Diana) encounter a male figure is when Steve Trevor (Chris Pine) crashes his German spy plane off the coast and is rescued by her. Dragging him ashore, there are echoes of The Little Mermaid as the handsome pilot awakens to a beautiful female looking down on him in wonder. Trevor isn’t alone, however, but pursued by German soldiers who pierce through the surrounding fog to invade the island. The ensuing scene, in which the Amazons charge forward to defend their island against the heavily armed troops, is extremely significant for the rest of the film and its message. Two elements are put on specific, detailed display: combat and costume. The Amazons are ready and Jenkins stages an enthralling battle in which the women’s physical prowess is put on grand display with acrobatic leaps and twists off rocks and horses, roundhouse kicks and spears chucked at men in between reloads. While the men gain initial advantage with their guns, the Amazon cavalry charge illuminates the invaders’ weakness: hand-to-hand combat. Confronted with physically adept, classically trained warriors, the German soldiers are soon overwhelmed by sheer skill. Jenkins employed many of the trademark slo-mo flourishes and battlefield gymnastics against a hypersaturated background of films such as Zack Snyder’s “300” and Wolfgang Petersen’s “Troy” to show the women working together and defending each other as a unit. Starting with the practice scenes and vividly examined on the beach is the Grecian battle costume worn by the women, including leather cuirass, pleated skirt, and greaves to protect the shins. Thus illustrates the importance of form and function in dress: the significance of our warriors’ short skirts and close-fitting breastplates removes sexual objectification and injects preemptive agency, rendering the wearer more adept at both combat and defense. It is the difference between a swimsuit worn by a centerfold model and a leotard worn by a gymnast: what is the context and purpose? Returning to our “damsel in distress,” Steve Trevor, whose character is never condescendingly drawn by Jenkins or screenwriter Allan Heinberg (from a story by Snyder, Jason Fuchs, and himself). His initial vulnerability is supplanted by his skill on the beach alongside Diana, who later defends him to her mother and surviving Amazons. When Steve is allowed to clean up, he evokes another scene from The Little Mermaid as he plays around in the bath and emerges naked to Diana’s surprise, but neither is too shy to refrain from conversing while he wraps himself in a sheet (too soon!). Diana has a healthy interest in the male form, having only read about it in books, and while Trevor plays the object of admiration (or scorn depending on who is looking at him), his objectification is more a reflection of how women have been portrayed in rescue scenes in movies for decades. There is an obvious chemistry between Steve and Diana (delicately portrayed between Pine and Gadot so as not to make their romance the focal point of a much bigger conflict), made lighter and more wondrous as Steve often has to defend himself against the larger male stereotype, as in one scene where Diana argues that men are “essential for procreation,” but not pleasure as stated in one of her books. Since she is a virgin, his battle is doubly drawn upward to prove this is not always so – what lovely pressure! As Diana’s heroine’s journey continues, so does her struggle between object and agent after she leaves her home and accompanies Steve to the world of man, which has been immersed in war for four years and consumed millions of lives already. Diana is convinced that the war is the fault of Ares, the god of war, who according to canon betrayed his father, Zeus, by corrupting his father’s creation: man. By wielding a sword Hippolyta calls the God-Killer, Diana believes she can kill Ares and end the war completely, despite Steve, a seasoned soldier, telling her that is impossible to eradicate for good. Unblemished and unspoiled by the actions of men, Diana is steadfastly positive and thus proactive in her quest, encountering every inch of the foreign world with wonder and honesty. When they get to London, Steve employs his endearing but underappreciated secretary, Etta (Lucy Davis), to help the tall, lithe, and striking Diana look a little less captivating.Confronted with corsets and choking necklines, close-fitting skirts and sensible shoes, Diana isn’t physically allowed to perform her intended feats – she is literally imprisoned in her garment. Etta, who has a more zaftig figure, knows this all too well. Steve thinks she is too distracting, which makes her dangerous in undercover work, but in a scene in a private war room when he tries to give his superiors a workbook he stole from a scientist working for the Nazis, Diana’s appearance, carriage, and demeanor also makes her an instigator, which to the councilmen is synonymous with a threat. This is a very teachable moment for mothers and daughters, or teachers and students, or coaches and athletes, or all three, in the expectations placed on women on the basis of form and function in dress. What message is it sending in different contexts? What functions does it allow or hinder? What are the rules and who made them? When Diana does meet a group of men related to Steve as fellow soldiers, Jenkins wisely does what her male counterparts often overlook or underwrite: she doesn’t make the counterparts of the other gender stock players. All are within their world but also without: charismatic Sameer (Saïd Taghmaoui) wanted to be an actor before the war but was excluded due to the color of his skin: Charlie (Ewen Bremner) is the jovial one of the bunch but is already showing signs of PTSD (he “sees ghosts”); Chief (Eugene Brave Rock) is stoic but haunted, having already experienced the decimation of his people by white men in wars past. Through these men, Diana sees the duality of a life in war, of being within and without both by force as well as necessity, as her confusion and horror at the plight of women, children, and other innocents deepens. Steve knows they can’t save everyone, that innocent people will die; at this point, Diana cannot hear this. She wants a finality. Steve knows war is never final. Eventually, Diana confronts her long-awaited sibling, Ares (David Thewlis), who shares her recognition of the fallibility of man but interprets this differently. It isn’t subtle that Diana’s red star on her gold tiara is countered by her brother’s war mask which resembles an inverted star. While Ares believes man’s weakness to be inherently corrupt and self-destructive, Diana believes their imperfection as inherently creative and capable of illumination. While Ares admits to being the inspiration behind evil acts, he refuses to be accountable or accept blame, leaving the sins to man. Diana agrees to man’s wickedness, but believes in their ability to be more. While her brother is focused on man’s descent, Diana expects better and focuses on the tougher and more painful ascent, in individual choice to love each other. While Ares relegates man to objects of manipulation and orchestration, Diana knows them to be agents of change, as she sees her image in them. In Diana’s final scene in the film, which flash-forwards to present day, her experience has illuminated her to the lack of finality in war and conflict and hate. Brilliantly, Jenkins doesn’t give Wonder Woman a happy ending, as Diana’s journey hasn’t ended. She is content and she is purposeful, her heart’s depths and sorrows unfathomable. “This is my mission now, forever,” she announces: to save the world through love. Setting aside ridicules of quaintness or naiveté by more jaded detractors, Diana sees love as a proactive and procreative force for change, and refuses to apologize for such forward positivity, even as her aunt’s words ring true: the battle won’t ever be fair. Echoing Fitzgerald’s words, her place in the world as a daughter of the divine and woman of the Earth is one of inclusion and detachment, enchantment at its beauties and possibilities and repulsion at its cruelty, and always, always forward and upward.